My first cousin three times removed was Collier Robert Cudmore (1885-1971), the cousin of my great grandfather, Arthur Murray Cudmore. Collier was the seventh of nine children of Daniel Henry Cudmore (1844-1913) and a grandson of Daniel Michael Paul Cudmore (1811-1891). Collier was born at the family property Avoca near Wentworth, in the far south-west of New South Wales. He attended school at St Peter’s College in Adelaide, going on to study at Adelaide University. In 1903 Collier rowed for St Peter’s against Geelong Grammar School; Geelong won. 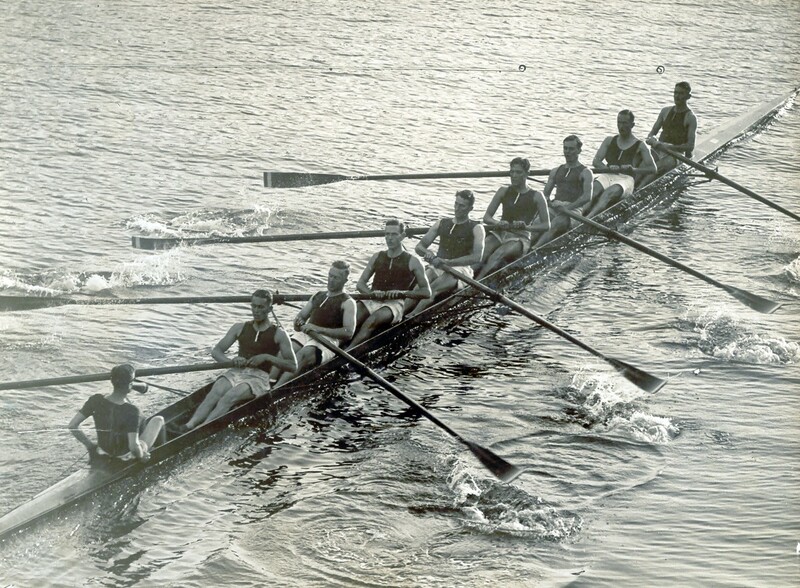 In 1904 Collier rowed for Adelaide University on the Yarra River in a university competition; Adelaide came second. In 1905 Collier again rowed in the University Boat Race for Adelaide but Adelaide again came second. In 1906 Collier matriculated at Oxford University, where he studied at Magdalen College. He rowed for Oxford in the Boat Race in 1908 and 1909. Oxford won in 1909. In 1908 Collier was a member of the Magdalen College coxless four, which won the Stewards’ Challenge Cup and the Visitors’ Challenge Cup at the Henley Royal Regatta. The four won forty consecutive events in 1907 and 1908. The Magdalen crew represented Great Britain rowing at the 1908 Summer Olympics, and Cudmore was the bow-man in the four. They won the gold medal for Great Britain. Illustrated London News 3 April 1909 page 26 retrieved from the British Newspaper Archive through FindMyPast. Collier is number 10 in the top right hand corner. Collier returned to Adelaide to practice law. He served with the Royal Field Artillery in France during World War I. His brother Milo Massey Cudmore, who was also a noted rower, was killed in action in 1916. Collier Cudmore served in the South Australian Legislative Council from 1933 until 1959. Collier bequeathed his Olympic gold medal and his medals from Magdalen to St Peter’s College in Adelaide. At St Peter’s College Collier and his brother Milo each have a rowing boat named after them. S is for St Eloi – the death of Milo Massey Cudmore in 1916. P. A. Howell, ‘Cudmore, Sir Collier Robert (1885–1971)’, Australian Dictionary of Biography, National Centre of Biography, Australian National University, http://adb.anu.edu.au/biography/cudmore-sir-collier-robert-9873/text17471, published first in hardcopy 1993, accessed online 2 April 2018. “Adelaide Rowing Club – The First Hundred Years.” Adelaide Rowing Club – Australian Rowing History, www.rowinghistory-aus.info/club-histories/adelaide/26-1.php. I do have a picture of my daughter rowing our dinghy at Batemans Bay several years ago. The mood somewhat less reflective than the young girl in Estonia a hundred years earlier. However the blogging prompt actually reminded me of my grandfather, Richard Geoffrey Champion de Crespigny (1907 – 1966). Geoff de Crespigny was a talented rower who was in the Melbourne University crew and also the crew for Trinity College while he studied medicine from 1927 -1929. This is a picture of the Trinity College crew in 1929. Geoff is number 7. Trinity lost against Ormond College in the University boat race of April 1929. However we do have two trophy oars as mementoes of my grandfather’s rowing career; one from Trinity College and the other from Melbourne University.